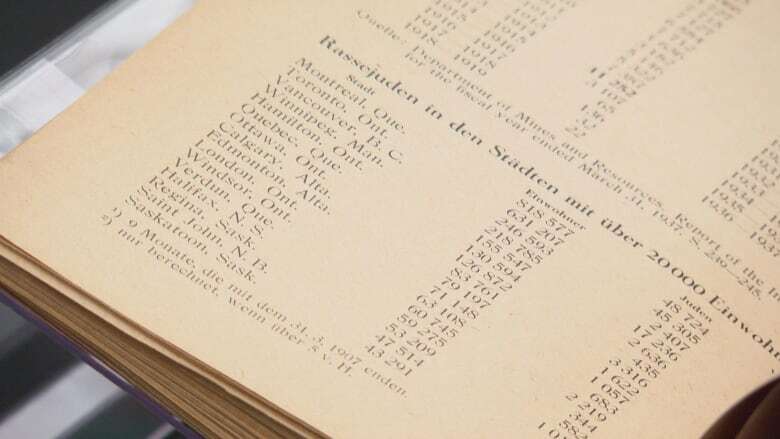 A book that once belonged to Adolf Hitler — and sheds light on the Nazis' plans for North America had the Second World War gone the other way — is now in the collection of Library and Archives Canada (LAC). The book, entitled Statistik, Presse und Organisationen des Judentums in den Vereinigten Staaten und Kanada (Statistics, Press, and Organizations of Jewry in the United States and Canada), is a detailed census of Jewish populations and organizations in North American cities. "This information would have been the building blocks to rolling out the Final Solution in Canada," said LAC curator Michael Kent. Major urban centres including Montreal and Toronto are on the list, but so are smaller communities such as Trois-Rivières, Que., which at the time had a Jewish population of just 52, according to the book. The 137-page book was commissioned by the Nazis and was written by Heinz Kloss, a researcher who worked for organizations that supported the Third Reich. Kloss was a linguist who lived in the United States in 1936-37, just prior to the war. He likely compiled the information through his connections with Nazi sympathizers and other researchers in North America. "[Kloss] had a very good network and relationship with researchers around the world," Kent said. "He's probably compiling from a range of secondary sources that he's getting from his contacts in North America," Kent said. The book was published in 1944 and was likely stored in Hitler's alpine retreat near Berchtesgaden, Germany, according to Kent. Inside the front cover is a bookplate inscribed with the Latin phrase "Ex Libris Adolf Hitler," a clue to its owner. "The bookplate is the main giveaway — that was a plate he put on all his books that were in his residences," Kent said. It's estimated Hitler amassed somewhere in between 6,000 and 16,000 books during his life. This book was likely taken by allied troops as a souvenir before making its way to a collector in the United States from whom LAC purchased it for roughly $6,000, Kent said. When the book appeared on LAC's radar, Kent said curators struggled with the moral implications of purchasing it. Other institutions including the United States Holocaust Memorial Museum refuse to buy items owned by Nazis. Ultimately, Kent said, LAC decided to purchase the book because of the prevalence of Holocaust denial and xenophobia. "While this is certainly a creepy item, the decision to acquire it was simple," he said. "The chance to acquire an item like this reminds us of ... the role we play in ensuring the memory of the Holocaust is preserved." The Simon Wiesenthal Center for Holocaust Studies is supporting LAC's purchase. Rather than being in the hands of groups like neo-Nazis, it is better the book is somewhere where it can be studied, said president and CEO Avi Benlolo. "We didn't know this piece of history and now we do because the library bought it." The book also brings that dark period home for Canadians, Kent said. "While we talk about the Holocaust as a European event ... I think what this item does is reminds us as Canadians that conflicts and human tragedies that seem far away can actually come to Canada." LAC actually purchased the book in June, but only unveiled it Wednesday after months of careful restoration. LAC will host a International Holocaust Remembrance Day commemoration on Sunday, where the book will be displayed.